The new addition... an Alpaca! I know, it's been too long since I last blogged. . . but, I was waiting till we got the new addition to our ranch, an Alpaca!! We picked him up yesterday. He is kind of wild and is sad to be separated from his momma, but I think he'll do just fine and friendly up quick. . . at least he needs to! We thought he was a "she" when we got him, but later found out "she" was a he. His name was Patty Kay, but that doesn't work for a boy name. So he needs a new name, obviously. Thinking about a few, but the one that is sticking at the moment is "Buddy" (I know, very original). Anyway, he is so tiny and soft. Part of my family thinks he isn't cute, some think he looks like a bird, others think he is cute (me). What do you think?? He really isn't dirty, as it looks - the white "dust" is actually his color. Last Monday I noticed that Peppercorn, one of our female llamas, wasn't acting right. Normally when I'd walk up to her, she would get up. This time, she didn't. I put the halter on her and had to force her to get up. Obviously, she was not feeling well. Monday night she was not going well at all, seemed really shaky and weak. I gave her Thiamine and a bunch of other vitamins. Tuesday morning she seemed much better but still "off". She has slowly gotten better, but she has still been doing one thing - hanging her head down about half the time when she is standing up. This can be a sign of pneumonia in llamas. I have been giving her tons of vitamins and things, and she hasn't gotten worse but not much better the past few days. So, last night we decided to start her on Penicillin. Hopefully it will kick in and knock out the pneumonia. Poor girl. Thankfully, she has kept eating and drinking this whole time. Last night it actually took 2 of us to hold her so I could give her the shots. . . so I guess that's an improvement. I just hope she gets all the way better. Last Tuesday we went and sheared a gal's gelded male llama for her. He was a real sweaty and took the whole thing really well, just on a halter. My clippers decided not to work well though, so I did most of it by hand. Thankfully we just gave him a barrel cut. In exchange for shaving her llama though, the lady gave us 4 turkeys, 3 silkie chicks and 1 silkie rooster. I guess the turkeys will be for Thanksgiving, and the rest just for the kids to have fun with ;). Well, not too much else has gone on. I am going to have to work with "Buddy", the alpaca, every single day to make him friendly and lead train him before mid-October (when the Down Syndrome Association of Tulsa [DSAT] Buddy Walk, where we are planning on taking several animals). "Cutie Booty", the little Nubian bottle doeling, is growing so well and is just adorable. I really need to get some new pictures of her. She is also being lead trained to go to the DSAT Buddy Walk. Well, life has been a normal-busy lately. 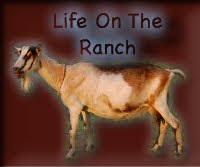 I went out in the pasture the other day and snapped some photos, so here they are. one of the pastures, it's getting kind of brown because we have not had a lot of rain! we still have lots of nice hay! Blueberry, she has turned into a really nice 2 year old! and this is from this morning. Me and my little sister milking - she milks really well for how little she is!! Larry the llama :(, auctions, etc. My family that was on the trip got home a few days ago, glad they got back safely. We've just been doing normal things around here. Thursday we went to an auction, wasn't much but did get some stuff for free. Next Thursday there is another one that is much bigger that I think we are planning on going to. Thursday afternoon everyone was fine. As usual, we filled the waters and hosed Larry (the "baby" llama) and Armor the puppy down - really likes water! Then after milking I went out to feed and found Larry dead, no clue why. He was perfectly fine earlier. He had come such a long way since we got him, from being terrified of people to coming up to be petted and was learning how to lead. Very sad, his sweet face will be missed :(. But, the Lord gives and takes away, blessed be the name of the Lord! We have slowly started integrating Armor, the puppy, and his goat friends into the herd - so hopefully soon they can go out to pasture here. I've gotta go eat lunch. Here are some pictures of the milk room. I gotta go, so enjoy the pictures, no captions right now! EDITED: Alright, I am editing this to add some more info to it. This is from the gate. The stall is 14'x14' or something close to that. The does jump on the short stand, then on to the big one. The floor in here is not cement. Cement would be nice, but this is pallets with rubber stall mats on top of them. 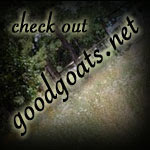 This is what the goats get to look at while being milked ;). The green on the ceiling is spray foam insulation, and it is behind the boards on the walls too. The boards were already up when we got this place, but we took them all down and insulated it, and put them back up. They are home-milled oak (I think) slats. This counter is where the milk is handled. It is filtered here and put into gallons, and then into the freezer (right outside the milk room gate). The strip cups are on the shelf up high, and the stereo :). And it would not be fun to milk in the summer without these fans!! 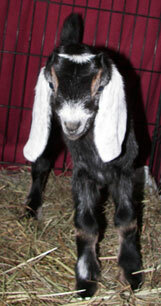 Yesterday morning it looked like Baby (Good Goats Baby Ruth) was going to kid. All day there wasn't much, and then we were watching something on the computer and I was checking on her every now and then, but nothing much - it looked like she was in early labor. I went out the next time (just a few minutes later) and she had just pushed a kid out! A beautiful red buckling. A few minutes later, she had a huge doeling - thankfully we didn't have to pull though, she came right out! I thought for sure she was a buckling before we "checked"! Baby has never had a doeling before - this is her 3rd kidding - first time she had a single buckling, second kidding she had twin bucklings, and then this time. Oh, and the sire to these kids is Ace, our FB Boer buck. I think our llamas are pregnant, at least the brown one, Peppercorn, is. Mom is unsure, but I am 99% sure, LOL! I have been watching their udders/etc. for a while now. Both of their bellies are hanging low, and then the other day Peppercorn's udder filled up - no doubt about it. So, I think she is going to have a cria soon - that would be exciting! Please discard the not-so-great haircuts (it was the first time I've sheared a llama) and them being dirty in these photos. . . they love to go in the pond, and then roll in the dirt. Other than that, we've just been staying busy. I have cleaned up and been decorating/organizing the milk room the past few days. When it is all the way done (for now, something is always changing), I'll get some photos to share. There are still a few things I have to do in there and in the kidding stalls and freezer area too. Oh, and for an update - Parker, the buck who had the cold, is totally back to normal. Dancer (with the barber pole worms) is also doing much better. Baby is SO wide!! She's still holding onto those kids. This is Cutie and her new little friend. I thought this was a weird picture of Prissy yawning! Does are starting to come into heat, FINALLY! Rosie is in heat today. . . I have 5 does that I will breed as soon as they come into heat - they are does that we either milked through last year and/or didn't breed. The bucks can be so loud when the does are in heat, and they go crazy, of course. Poor little Berry has urine scald on his face. I've cleaned it and put cream on it. It doesn't look that bad, just a spot is bald now :(. odds and ends. . . I stink SO bad right now like a BUCK! This morning Rhia, one of the Nubian does, was (is) in heat. So I got little Berry out, the Nigerian buck. Long story short, he's a little bit too short but might be able to breed her if I try later today or on her next heat. If he can't breed her on her next heat, I'll use a different buck. The photo below is of my little brother, Osiyyah, "helping" with milking :)! Today the plan is to clean/organize, and I am hopefully going to organize/"decorate" the milk parlor. . . I'll get pictures when it's done, Lord willing. And this is a little something I haven't talked about really. . . the rabbit barns. This is the meat rabbit barn. Right now we only have 3 meat rabbits (& 1 baby). The other bunnies, the Mini Lops, have their own special barn with shutters and an air conditioner. Pretty cool. You can see it on my sister's website here. meat rabbit barn, just recently finished. New kid and crazy days! I know, so sorry for not posting sooner! We have been incredibly busy the past several days, as part of my family went on a trip to California (for too long, LOL :)! ), so we have to do all their animal chores on top of ours. It seems like we are having 18 hour days right now. . . and come to think of it, I guess some of us really are! Anyway, I think we'll survive until they get back ;). Plus it has been SUPER hot here, which just complicates things - getting up to 103-105 every day the past few days. Sunday morning Mom woke me up saying that Prissy was going to have her babies soon. We got up and got most of the does milked before she had the first one - a totally cute little BUCKLING. He is polled. 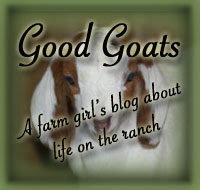 So as usual, I milked Prissy, fed the kid, fed all the other goats, and was still waiting on Prissy. She was having pretty good contractions on and off, enough to make me concerned. About 2 hours after she had the first kid, we decided to go in and find out what was up. Mom felt something, and it ended up being a small kid folded in half. She had to pull his head up and then he came out, and the placenta plopped out right after him. Unfortunately, he was not alive :(. Her entire labor seemed weird to me, as her contractions before she had the first kid were REALLY hard. So I don't know when he died, but it was a bummer - always sad. But, God causes everything and we have to be thankful for it all! After dealing with that, this little guy was not-so-smart when it came to drinking out of the bottle, but finally got the hang of things. His sire is PawPawNin Quiet Wyatt. So he is 75% Nubian, 1st generation. . . polled. For an update on Dancer (with the worms) - so far, so good. He still is awfully thin, but is eating and much perkier than before. Loosing weight in animals is easy, making them gain it back can be quite a pain at times. Sunday afternoon it poured rain, and it was still really hot out, so it got really humid. Yesterday morning I noticed that Parker had a runny nose and was kind of "off". This is prime weather for pneumonia. So, I gave him a bunch of vitamins and went off to town. Last night he seemed alright, but I gave him more vitamins and started him on Penicillin. He also had a slight fever. This morning, no worse and he is eating, which is good, but I went ahead and gave him a shot of Banamine. Hoping he doesn't get any worse. We're still waiting on Baby to kid. . . she is so fat and her udder is full! Today she is on day 146. Time to go too some more things! Have a good day!